This 1930's cupboard has some lovely detail. The scroll handles are original with their little bakerlite inserts and the panelling on the front at the bottom with the flowers and grooves. 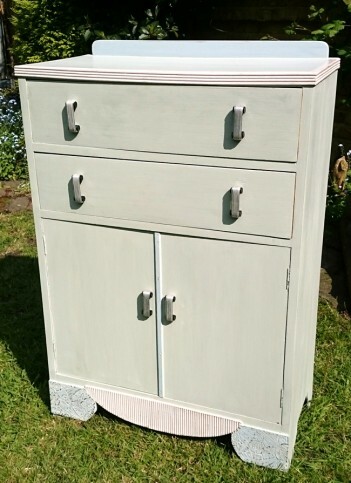 WE have painted it using Grand Illusions Vintage paint and we have gone for a pastel combo in a pale green 'Gulls Egg' and we have picked out the detail in a pale blue 'Stockholm, pale pink 'Powder' and the inside is painted a more vibrant green 'Artichaut'. Finally we applied some clear wax and buffed it, this seals the paint providing a nice tonal effect.